Our new home has an extremely small kitchen with very little space for storage. This is a huge problem for someone that has tons of dishes, pans and gadgets and up until now I’ve stored them on shelves in the basement. Storing them in the basement works until I need something in a hurry and have to climb over plastic totes and boxes to find things I use periodically. Plus the lighting isn’t the greatest which creates a real challenge in the evenings. ﻿How did I do it? 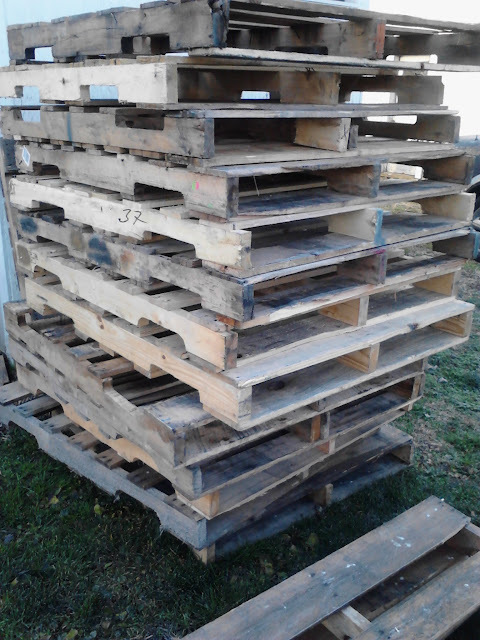 I started with a large pile of pallets and then dissembled the pallets using a reciprocating saw with a demo blade. The demo blade cuts through about anything making it super easy to dissemble the pallets in no time. 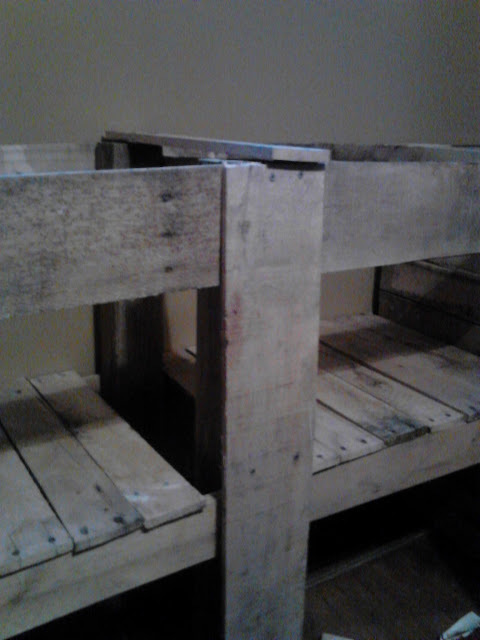 For the legs, I used 4×4’s from my wood pile stash. Using screws I attached pallet planks on both sides of the 4×4’s at the top and 18in. from the bottom of the backside legs. For the sides I added planks from the back legs to the front legs. 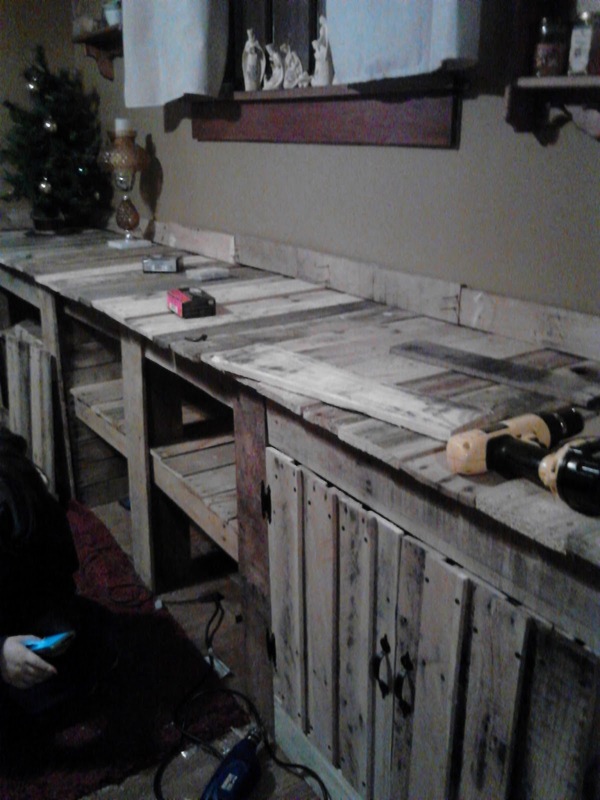 Multiple pallet planks were then added to finish off the sides of the inner side of the outer sides of the cabinet for a finished look. I then added recessed planks for the middle sections using small chunks of pallet wood and screws. Wide pallet planks and flat corner brackets were used to frame in the outer sections of the cabinet to create the frame for the doors. 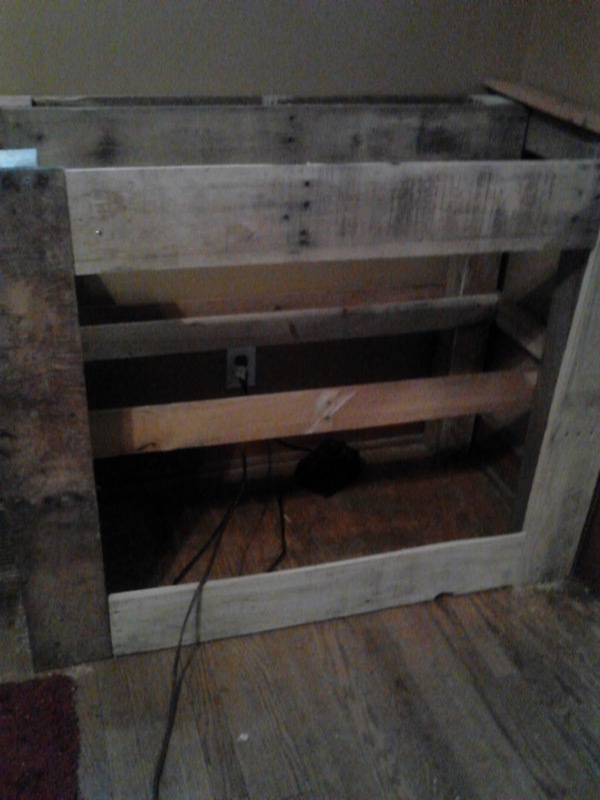 After framing in both sides, I measured and added small planks to the bottom shelves and the counter top. The pallet runners were used to connect the individual boards in each section of the cabinet by simply screwing in the boards and then screwing the sections into the 4×4’s. To finish off the top of the counter top, small pallet planks were nailed in place along the wall. Planks were cut to the length of the opening of the outer sections and screwed together to fill the inside of the openings. 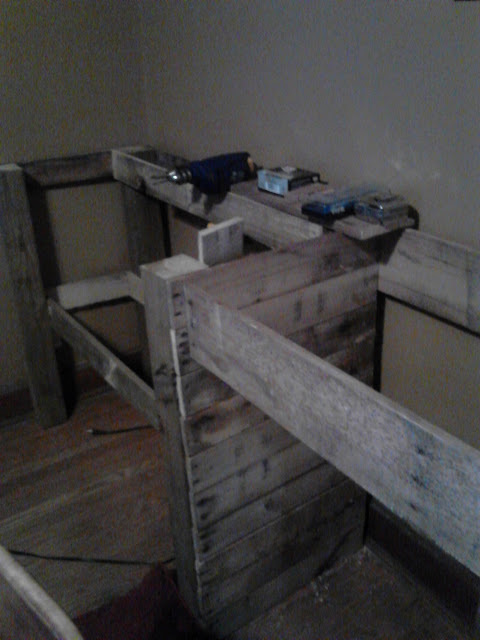 All that was left was to add the hardware and hang the doors. Before cleaning up and moving items in I sanded the top counter top using a hand sander. I plan on staining and sealing the cabinet as soon as the weather climbs to warmer temperatures. I am very pleased with the outcome of my project. 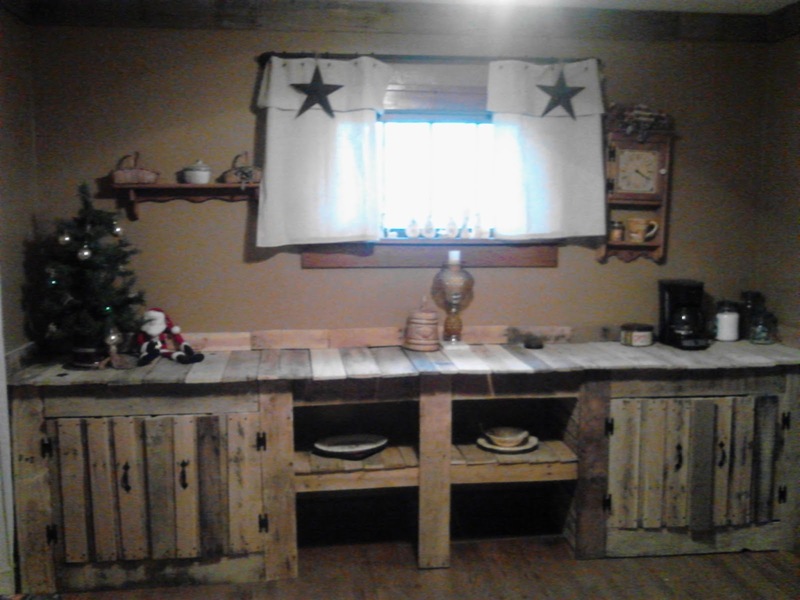 I was quite the experience building something this large without plans or knowledge of cabinetry. Yes it has flaws and that makes it even more unique. Love it! It is safe to say this is my favorite creation of 2012 and I am looking forward to upcoming projects in 2013. WOW, great job! 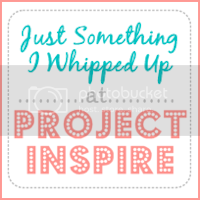 That is a big undertaking and you did it so well!